You can buy the Ebook version of this book on Amazon for $9.99.The physical version is pricey, but I went all out with the print, making it a true pleasure to read.It’s a lengthy full color book and the pages are the size of a school text book.It really looks beautiful and you’ll enjoy the experience a lot more than you would on your kindle or with a small black and white paper back.IF this is an important topic for you, it’s money well spent and you have both options available.. From the writer @ StayinginThailand.com If you live in Thailand or you’re planning on it, this will be one of the most important books you will ever read. That is obviously a bold statement, but I proudly stand by it. You can live a great life on $2,000 USD per month in Thailand. As luring as this may seem, making that amount is easier said than done. Most people who attempt to live the dream fail. I have lived in Thailand for many years and I’ve flourished here. More importantly I have made it a point to uncover how every successful expat I have ever met in Thailand has actually done it. This book exposes every last secret to success in Thailand. There is no way that you can read this book and not figure out how to make $2,000 per month; it’s just too darn thorough (4-5X as long as any other book on the subject), and there are too many viable options and tested methods. I’ve literally poured my soul into this book. If you possess any sort of entrepreneurial spirit, you can carve out much more than $2,000 per month over time with the techniques I exhaustively cover in the book. But even if you don’t have a knack or passion for business at all, I can still get you to $2,000 per month.Some of the information in this book actually hurt me when I wrote it; the information was so dear to me and so important to me that I cringed while questioning whether or not I should even continue the book at times. Will I be competing with some of you? Will some of you beat me at my own game? Will some of my very best friends hate the fact that I’ve exposed every step they’ve taken to make a great living? Maybe, but the way I figure it, there are more than 60 million people in Thailand, so there is plenty of room at the top. Either way, this book is the very best I have in me; I have been obsessed with making it perfect and I have left nothing of importance out.It’s almost impossible to find good information on the subject because anyone who has done well for themselves in Thailand knows they’re better served keeping their mouths shut about their secrets to success. I haven’t just crossed that line, I’m demolishing it, and not only for me, but for all the people I know who have it good here. I am outing each and every one of their strategies. If that makes me a whistle blower, then so be it. I know there are people out there who could live such a better life than they currently do in their home country if only they were able to make a suitable living in Thailand. There are also a tremendous amount of expats who love Thailand and try to make it here, but wind up going back home after a year or two because they just couldn’t find a good enough job. I know the scene here; I have written one of the most successful Thailand related books and I’ve been here for a long time. 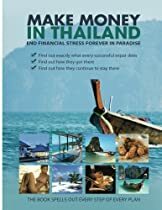 I can say without any hesitation, that this is the most important book anyone currently living in Thailand on a budget, or anyone interested in living in Thailand could ever buy.I don’t care if you’re 20 or 70; I know people of both ages and everything in between making well over $2,000 per month in Thailand and it’s all broken down systematically for you in this book. Whatever your situation is you’ll have a winning plan by the time you finish reading this book, and I’m sure you’ll be plotting, note taking, brainstorming, and number crunching as you read through it.If you buy the book, you can feel free to email me with questions; I am diligent about answering all emails.